Ems Ukase. 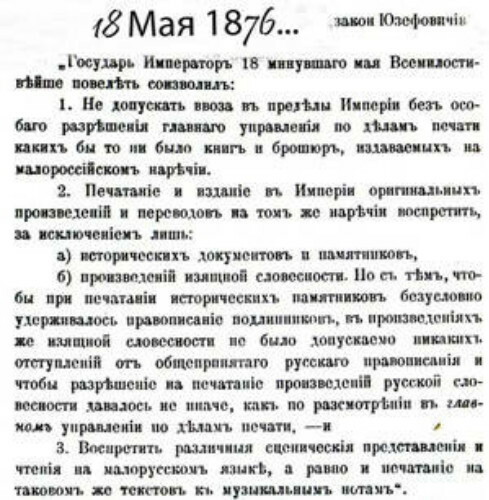 A secret decree issued on 30 May 1876 by the Russian tsar Alexander II in the town of Ems, Germany, aimed at stopping the printing and distribution of Ukrainian-language publications within the Russian Empire. 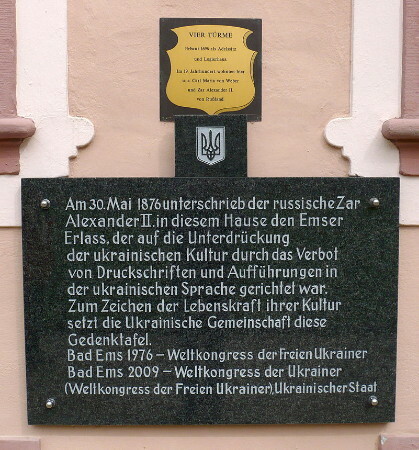 It represented a continuation of the repressive anti-Ukrainian policy introduced by the circular of the Russian minister of internal affairs, Petr Valuev, of 20 June 1863. The Ems Ukase prohibited the printing in the Ukrainian language of any original works or translations. Historical documents could be printed in the original orthography, but belles-lettres could appear only in Russian orthography. It also forbade the importation from abroad of Ukrainian-language publications, the staging of plays and public readings in Ukrainian, and the printing of Ukrainian lyrics to musical works. All manuscripts permissible under the new act were subject to approval by the censors before publication. 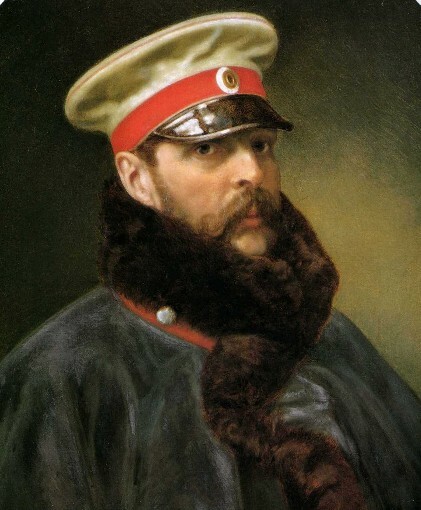 Known also as the Yuzefovich Ukase (after its author, Mikhail Yuzefovich, deputy curator of the Kyiv school district), it summed up the work of a commission set up in 1875 to inquire into ‘Ukrainophile propaganda in the southern gubernias of Russia.’ Normal legislative channels were circumvented, and the Ems Ukase was never examined by the State Council or the Council of Ministers, nor was it ever formally revoked, despite pressure from Ukrainian and progressive Russian circles. It dealt a crushing blow to Ukrainian culture and coincided with the closing down of the Southwestern Branch of the Imperial Russian Geographic Society and the newspaper Kievskii telegraf (unofficial organ of the Hromada of Kyiv), and the expulsion of a number of professors from Kyiv University (Mykhailo Drahomanov, Mykola Ziber, and others). As a result of the decree not one Ukrainian book appeared in print in 1877. In 1878 at the International Literary Congress in Paris, M. Drahomanov severely condemned the Ems Ukase and defended the Ukrainian language in his brochure La littérature ukrainienne, proscrite par le gouvernement russe. Rapport présenté au Congràes littéraire de Paris (Geneva 1878).